Startups making 3D printers have electrified the tech industry. Just ask Voxel8, a Boston-based startup that makes what it says is the first 3D printer able to print electronic devices. Or ask In-Q-Tel, the venture capital firm with links to the Central Intelligence Agency. In-Q-Tel recently made a strategic equity investment in Voxel8 and also signed a technology development agreement with the startup. Voxel8 announced the news Thursday, although it did not disclose how much the firm invested. Voxel8 has developed a 3D printer that allows users to add embedded electronic circuits to the plastic objects they create. The machine does so by printing with a silver ink that conducts electricity. The machine also works with the conventional thermoplastics used by other 3D printers. Harvard University professor and material scientist Jennifer Lewis developed the technology in her lab, along with other 3D-printing technology. 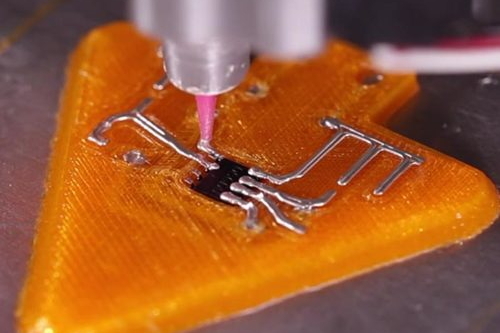 Voxel8 was spun out last year to focus on commercializing 3D-printed electronics. Xconomy reported in January that the company has raised about $2 million in venture capital, including an investment from Braemar Energy Ventures, and $50,000 from winning the MassChallenge business plan competition. Voxel8 co-founder Daniel Oliver said the money from In-Q-Tel will help the startup fulfill pre-orders and manufacture its first run of printers, which should be available late this year. With the machines priced at $8,999, the printers are targeted for professional designers and engineers, Oliver said. He thinks they’ll be used for prototyping, and one application could be designing wearable or customizable medical devices, but he said the company’s strategy is to work with designers and see what they come up with. The technology is so new the proverbial killer app has yet to be discovered. “We made it to be a platform that’s really good for experimentation,” Oliver said. Once the best designs and uses are identified, Voxel8 intends to have the resources and ability to scale up to take advantage of that newfound market. In-Q-Tel’s investment is a clear sign intelligence experts think Voxel8 is on to something they’ll be able to use. In-Q-Tel is an Arlington, VA-based firm that says on its website that its purpose is “to support the missions of the Central Intelligence Agency and the broader U.S. intelligence community” by investing in venture-backed startups working on “ready-soon” technologies. Despite the ties to the intelligence world, the firm itself is a private entity that’s structured as a nonprofit that reinvests its gains into its portfolio companies or new investments. Oliver made clear he was not speaking for In-Q-Tel, but he did say the firm takes a hands-off approach with its portfolio companies and wants them to develop products for commercialization. The companies in In-Q-Tel’s portfolio typically are not inside the defense industry, and its high-profile investments include Palantir Technologies, Pure Storage, and MongoDB. In a release, In-Q-Tel’s Vice President of Field Deployable Technologies Megan Anderson said her firm was interested in how Voxel8 could be a breakthrough leading to changes in the design and manufacturing process. “The customization enabled by Voxel8’s technology allows users to quickly create new devices without the inconvenience of tooling, inventory, and supply chains associated with traditional manufacturing methods,” Anderson said. While it’s tempting to imagine the gadgets Voxel8 printers could create for real-life versions of James Bond, Oliver declined to speculate about what intelligence experts might have in mind. He did say that internally Voxel8 has been working on ideas that could have civilian military or intelligence applications, such as antennas printed in unconventional shapes.